Ravenox by FMS diamond braid utility rope is perfect for any use you may have. Made here in the United States from the best materials for everyday use. Soft, supple and extremely flexible, it is easy to tie knots in and splice and it's waterproof as well as resistant to most oils, lubricants and grease. Ravenox by FMS is a certified Service-Disable Veteran-Owned Small Business and our rope meets the rigorous manufacturing and testing procedures set forth by the American Cordage Institute and we are proud to be 1 of only 29 manufacturers in the world that helps set the standards in rope manufacturing. RAVENOX BY FMS ROPE IS CUT TO LENGTH and packaged in 10 feet, 25 feet, 50 feet and 100 feet variations and is also available in full spools by the thousands of feet. 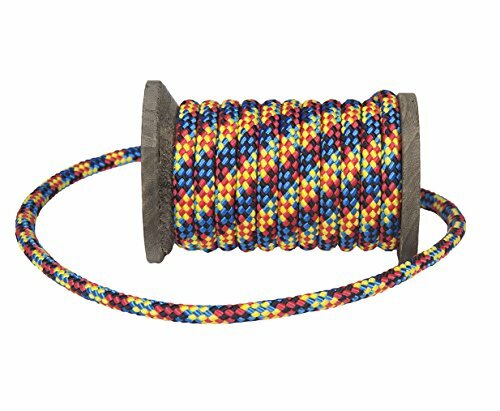 The 3/8-inch rope has a break strength of 1,250 pounds which is more than twice as strong as 550 Paracord. 100% 1-YEAR MONEY BACK GUARANTEE. Frontier Market Solutions is a certified Service-Disabled Veteran-Owned American Small Business that backs all of its' products. If you're not 100% satisfied, you'll get your money back. Frontier Market Solutions' rope meets the rigorous manufacturing and testing procedures set forth by the American Cordage Institute and we are proud to be 1 of only 29 manufacturers in the world that helps set the standards in rope manufacturing. This Rope is Made in the USA.